Summer is just around the corner which means summer vacation for my girls. That leaves me to finding things to keep them busy in between what they come up with, mostly for rainy days where they can't get outside to play. Having little toys like this building kit, and craft projects really saves the day in more ways then one. It gives my child something fun to do while they are learning to read, follow instructions, match up pieces, sort, count, and of course build. Great for children ages 5 and up. 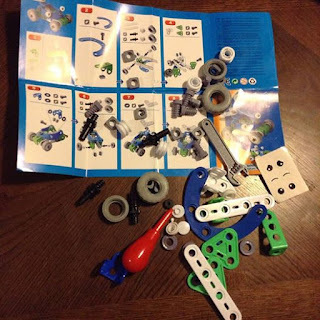 Everything is included to make two different models but with a little imagination your child might even be able to make a few other designs of their own. The Take-A-Part Build Toy is available on Amazon. What Elf Star has to say about their product. The take apart vehicle is a great development toy for children who love to assemble and build! 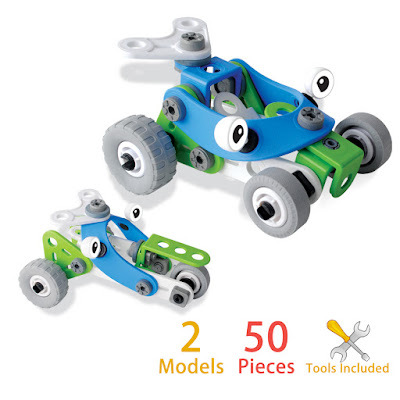 With this set, children can build their own vehicle, take it apart and rebuild again. Two plus models can be built from the set. Encourage your children to find more possible ways to build. The fun is endless! Disclosure: MarksvilleandMe received one or more of the products mentioned above as part of a promotion with Tomoson and Elf Star. Regardless, MarksvilleandMe only recommends products or services we use personally and believe will be good for our readers. Some of the links in the article may be “affiliate links.” This means if you click on the link and purchase the item, I will receive compensation. If you would like MarksvilleandMe to review a product or service please contact us at marksvilleandme@gmail.com.